It was another week of mourning because one of my mom’s furbabies departed. Ingrid had come through surgery to remove cancerous tumors a few months back like a champ; in the end, she couldn’t survive a necrotizing spinal cord. I couldn’t even be there for the final goodbye given the crazy at work. I’m grateful my three continue in good health, and remind myself every day to appreciate the joy they share in their simplest interactions with us. I hope it is many years before we face the heart-break and further expansion of our hearts when the next one passes and we open our home to a new generation of furbabies. I also spent a lot of time this week making sure Gayla’s latest was as thoroughly edited as possible. Black Magic Shadows went live in the early hours of this morning, and by this evening already has its first five-star reviews. I’m really pleased with our teamwork on this one and am crossing my fingers that the series continues to support her income needs–even as she moves on to her next set of plotbunnies. Between the joy of the latest Discord book and the pain of Ingrid’s loss… Somehow another week has slipped through my fingers. The deadline I’d set for myself for revising Red Slaves #1 has come and gone. I haven’t even had time to look at the relevant files. I’m beginning to wonder whether I’ll ever get my writing groove back. I may be a strange kind of burned out. Gotta love hubs, though, for sending links to articles like this one, which remind me that as long as I continue to take one step at a time and retain my discipline, I may eventually get through my overly long to-do list and find the energy I need to face off with my story ideas. We walked most nights again this week, though my phone only recorded 3.5 miles of our exercise. With everything going on in the family, though, we didn’t get our date night–though I was able to enforce a not-going-anywhere day today at least. I’m also becoming at least slightly more serious about studying for the PMP–and am certainly getting an extra work-out toting the PMBOK study guide to and from the office. So I soldier on. If you check back next week, maybe, finally, I will be able to share news of new words. In the interim, check in with the other ROW80ers to see where they stand in relation to their goals. It takes time to recover after any loss of a loved one, furry or not-so furry. My condolences to you and your mother, Tonya. 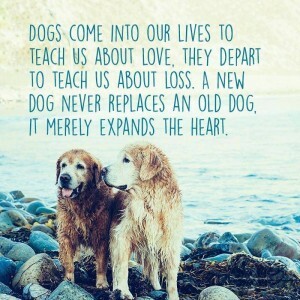 May you have many years with furry ones who remain with you. Until then, as you say… “soldier on”. Sometimes that’s all you can do. Eventually you’ll get there.